I love Halloween. 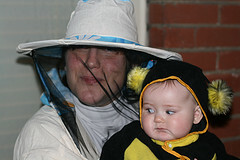 You can always dress up a baby and go door to door even if you don't collect candy. Take it as an opportunity to visit your neighbors. Great idea, Joyce! On that first Halloween, The Parasite and I stayed in our costumes and handed out candy to all the kids in the neighbourhood. Kids who fawned over her got extra candy, because they earned it!